1. Its image is clear and stable, and has a high resolution. 2. 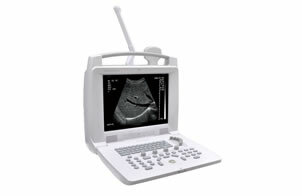 Four display modes have designed for this laptop veterinary ultrasound scanner: B, B+B, B+M and M.
3. It can amplify the frozen, real-time and partial images, and it can be reversed up and down, left and right, and black and white. 4. It has 10 different kinds of body marks and lithotripter positioning function is also available. 5. Portable injection molding shell, transformer switch power supply, and programmable components are employed. 6. Surface mounting technology has been used in this PL-3018I laptop veterinary ultrasound scanner. 7. Built-in pseudo-color processing module, and PLA-D and VGA video output are accessible, and it can also be connected with large-screen monitor, color display, video image printer, and many other devices. 8. 2 USB ports and 2-probe connectors are designed for it. 9. Its standard configurations include main unit and 3.5 MHz multi-frequency convex probe. And its optional configurations consist of 7.5 MHz linear probe, 6.5 MHz transvaginal probe, 5.0 MHz micro-convex probe, MITSTUBISHI thermal video printer, SONYUP-897MD thermal video printer, and trolley. 9. Local zoom: intelligent amplification in real-time and forzen mode, 4-step. 17. Chinese-English inter-conversion is available. 21. STC: 8 slides for near, far and overall gain control. 7. Annotation database is available, and the pre-saved phrases can be recalled at any time. We are a professional manufacturer and supplier of laptop veterinary ultrasound scanner in China. Our laptop veterinary ultrasound scanner image is clear and stable, and has a high resolution. Apart from laptop veterinary ultrasound scanner, we can also provide other products, such as 3D ultrasound scanner, portable ultrasound scanner, trolley ultrasound scanner, etc. And our products have received the certification of CE and ISO. They have been quite popular among customers from Syria, Kazakhstan, Kyrgyzstan, India, Pakistan, Iran, Vietnam, Indonesia, Britain, Germany, Italy, Sweden, Romania, South Africa, Egypt, Ecuador, Uganda, Bolivia, Paraguay, Uruguay, Mexico, the United States, Canada, Argentina, Peru, etc. If you need laptop veterinary ultrasound scanner, please contact us freely. 1. Microcomputer and digital scan converter (DSC) are designed for this scanner.